Eating as a tourist in Japan is a revelation because the majority of dining establishments hold themselves to very high standards. The food quality and cleanliness everywhere we ate from casual food markets to fine dining was remarkable. Nonetheless, traveling away from the tourist areas with the help of local Japanese friends and eating in restaurants you would never have found on your own is something I would urge anyone hoping to get a glimpse of how Japanese people really let loose. The only caveat is that many people outside the heart of the city don’t speak fluent English, so connecting with a Japanese speaking friend or tour guide is really the best way to go. Speaking of Japanese friends, my wife and I were fortunate enough to meet up with a friend of mine living in the area near where we were staying. He and I attended high school together for one year while he was participating in an exchange program. Needless to say, he left an impression and we managed to reconnect over social media many years ago as long distance friends tend to do. When my wife and I planned our trip to Japan, I knew I had to reach out and see if my friend could meet us once we were in Tokyo. He enthusiastically agreed, so that’s exactly what we did. He and his wife took us out to show us the best tourist areas of the city such as the Tsukiji Fish Market, the Tokyo Skytree, and more. Most importantly though, they took us off the beaten tourist path to their neighborhood just west of the city to try restaurants we would never have found on our own. 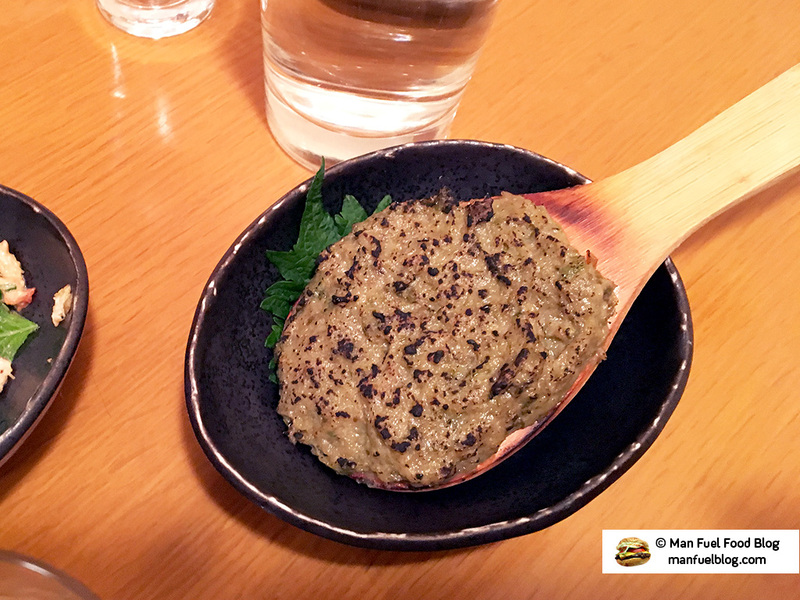 At Miroku, we tried new foods and met new people like the chef-owner, Mr. Yuchiro Nakajima who welcomed us to his restaurant personally. He even humored us by speaking some English phrases and promising us that when we returned, he would speak perfect English! This adventure turned into my favorite part of our trip as well as provided us with some of the best food we had. Japan is beautiful, the people are friendly, and the city of Tokyo is vastly impressive, but in the end, sharing a meal with friends in a new place on the other side of the ocean turned out to be exactly what I enjoy most about traveling. 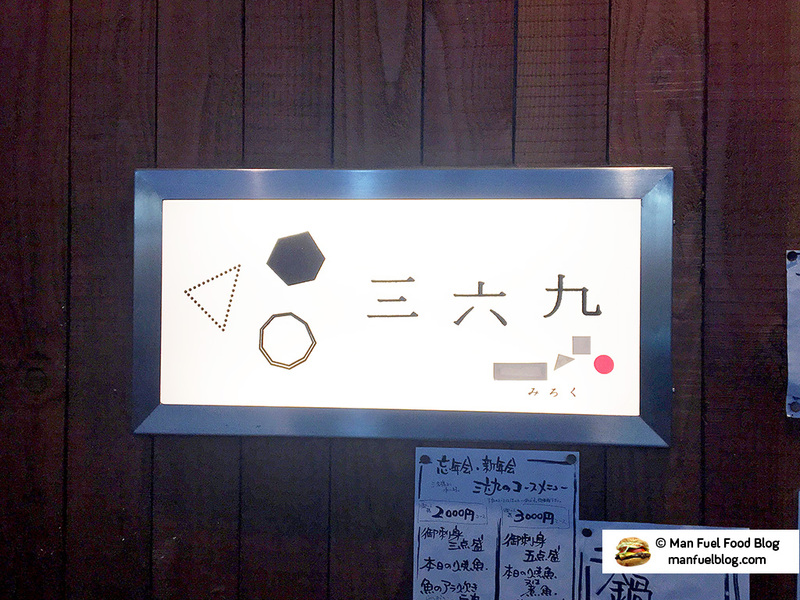 At first glance, the only indicator that a wonderful restaurant resides behind the simple yet mildly ornate door is a glowing rectangular sign in Japanese featuring the name of the restaurant with its multi-shape logo. The interior is warmly lit yet very small with limited seating at both the counter and a few tables. The setting is intimate and yet allows for moments of boisterous laughter shared between the staff and patrons. I’d be hard pressed to call Miroku an izakaya (Japanese pub) despite the fact that casual atmosphere invites patrons to enjoy plenty of sake and beer there because the food is on another level entirely. 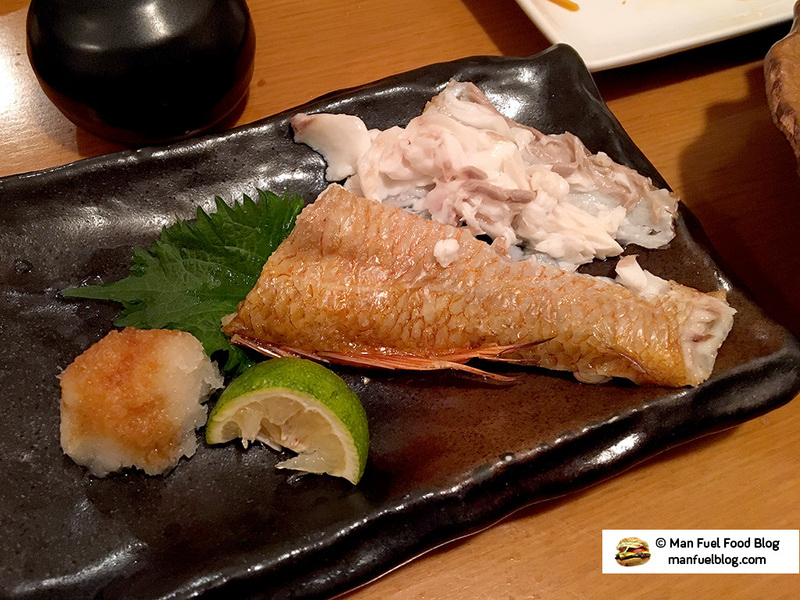 It’s really more of a hybrid between an izakaya and a fine dining restaurant. The service at Miroku is also impeccable from the attentive, friendly waitstaff to the charismatic young chef-owner, Mr. Yuchiro Nakajima (pictured below behind the counter in the plaid shirt). As far as the food we ate in Japan, it would be hard to pick a single favorite item as so much of the food was so utterly fantastic. Nonetheless, our meal at Miroku was my favorite overall experience while in Japan due to a combination of food quality, atmosphere, and the friends we were with. With that said, all 12 courses we ate at Miroku were expertly prepared by chef-owner, Mr. Yuchiro Nakajima leaving us satisfied, but always wanting more. 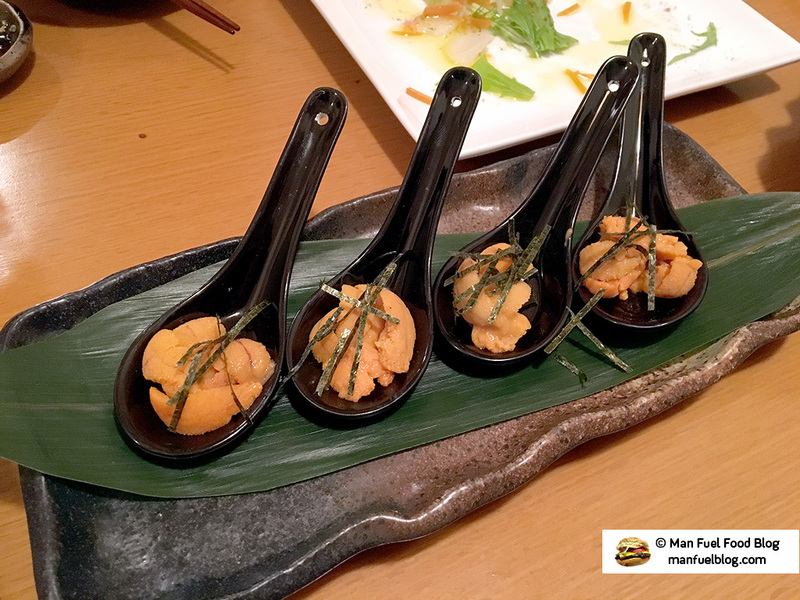 I would be remiss if I didn’t mention that Miroku offers a wide variety of sake and some beers to accompany the meal because we did partake in a lavish sake sampling; however, I’ve only focused on the food for this review. 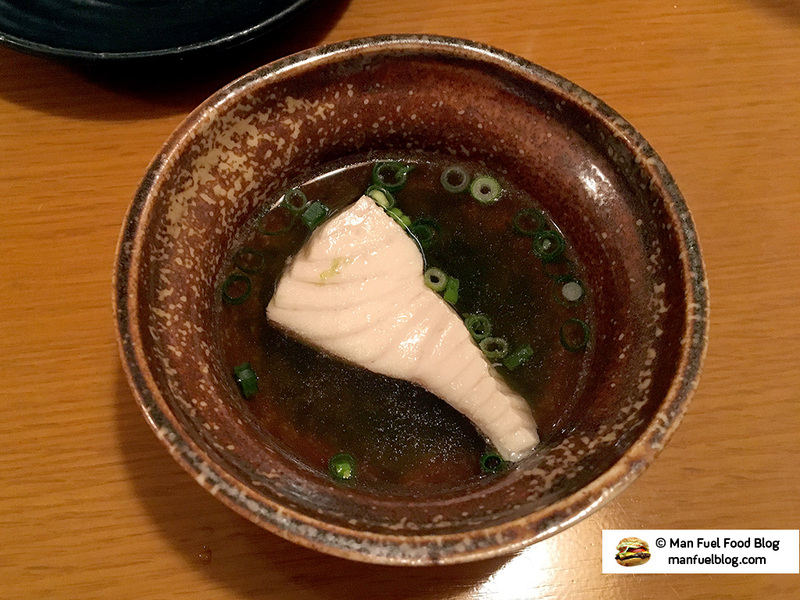 Poached Fish in Broth – Our meal began with a beautifully tender piece of white fish poached in a simple broth accented with scallions. The flavor of the fish was forward, but not overpowering while the broth tasted mild yet refreshing. 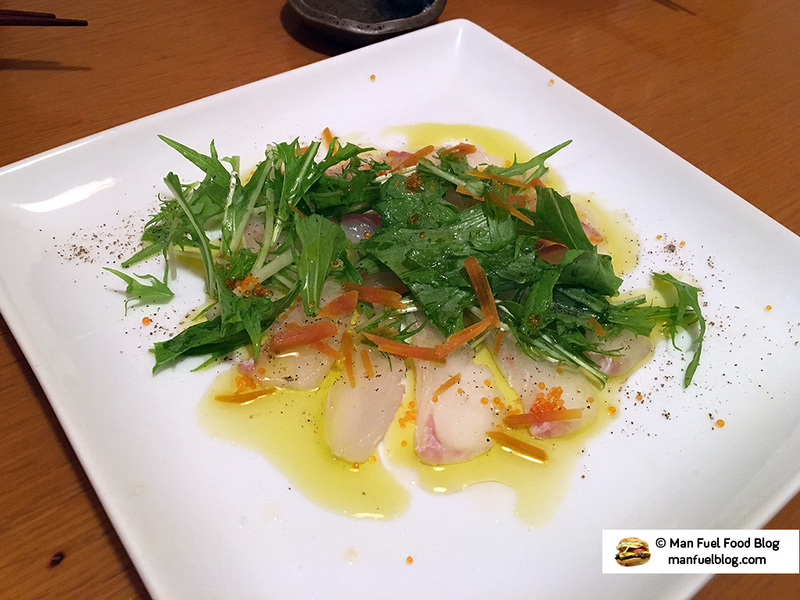 Raw Scallops – I believe the next dish was raw scallops served with herbs and dressed simply with olive oil. The dish had a very Italian feel due to the olive oil and herbs used. The shellfish were sweet, fresh, and cool, with a wonderfully firm tenderness. 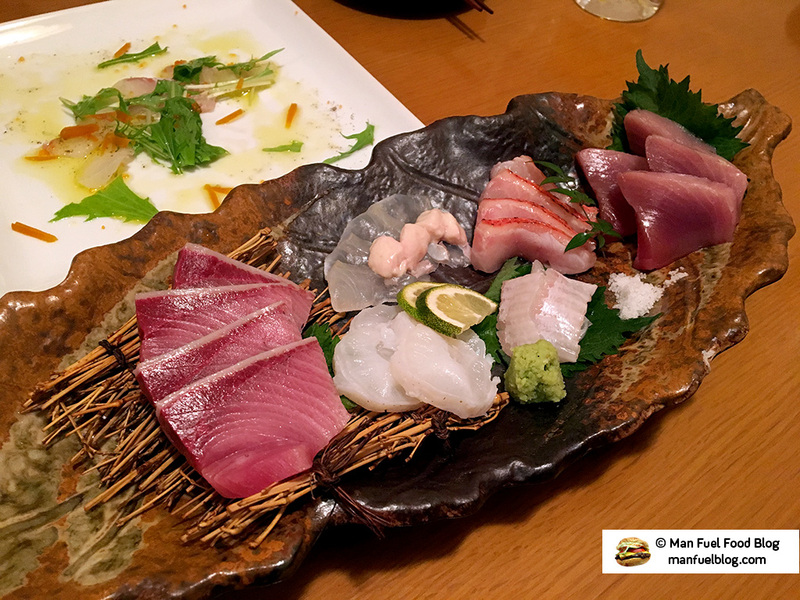 Sushi / Raw Fish Plate – This assorted plate of raw fish was some of the freshest and tastiest raw fish I’ve ever had. I can’t remember all of the kinds of fish, but two kinds of tuna featured prominently while many of the lighter fish were dressed in different ways. Some had a little wasabi while others a touch of lime. The most interesting were the pieces topped with a bit of fish liver, which tasted like the ocean mixed with minerals. I loved the presentation as well. Red Fish – While not a bad dish at all, this was probably my least favorite of the delicious parade of food that evening. The skin of the fish was soft, so we didn’t eat it, but that was probably due to the cooking process that rendered the interior extremely tender and full of concentrated fish flavor. 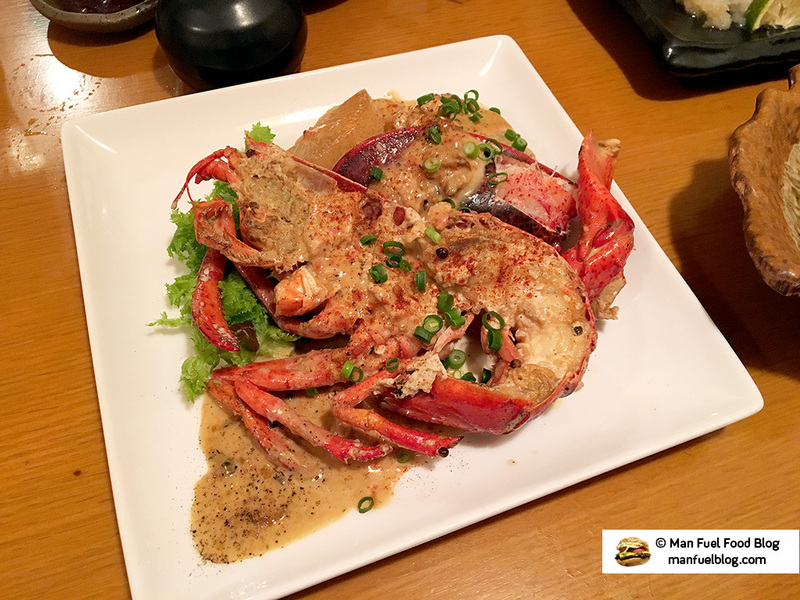 Japanese Spiny Lobster – Coming from the Northeastern U.S., this lobster dish was my time to shine. My local friends weren’t completely sure how to share the dish so I volunteered to remove the meat from the shell allowing us all to share. With expert (i.e. very messy) lobster shucking skill, I removed the tail meat (Japanese lobsters don’t have huge front claws like Maine lobsters) and we shared the sweet and perfectly cooked lobster. The sauce over the top didn’t detract from the natural flavors of the lobster, but rather just augmented it adding a little variety to the dish. 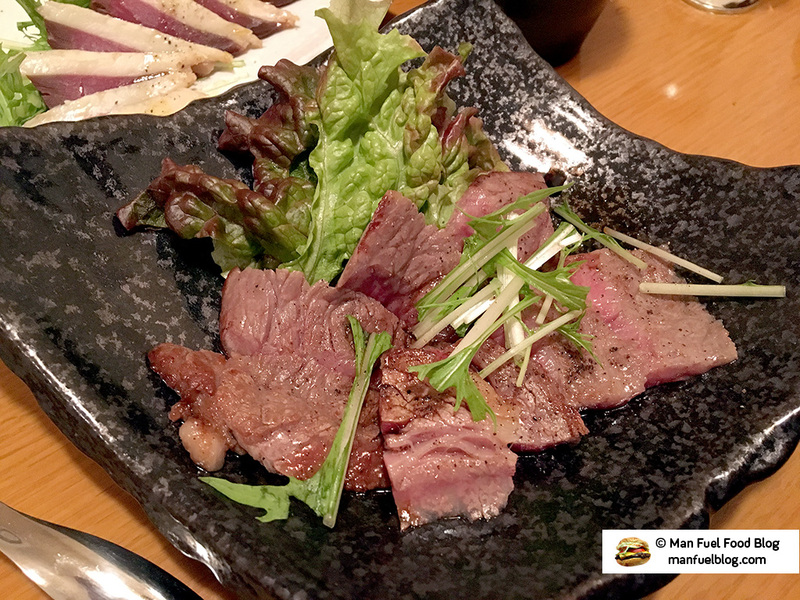 Quality Rare Beef – Another simply prepared and yet phenomenal dish was the high quality beef served rare, topped with some black pepper and herbs. 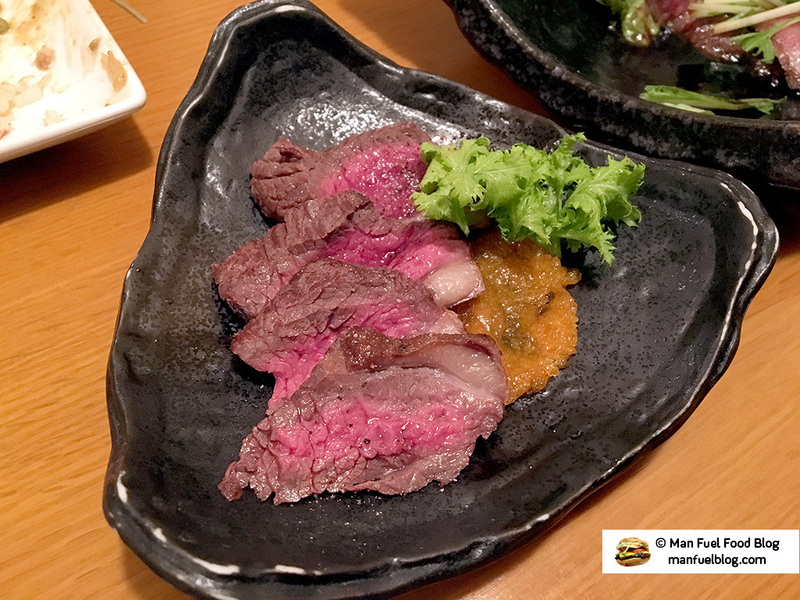 The meat was extremely tender and full of natural beefy mineral flavor. Cured Duck Breast – I absolutely love cured duck or duck prosciutto and this preparation was no exception. The fatty and lean parts of the duck breast came together to form an exquisite balance when eaten. The flavor of the duck was paramount with just a hint of black pepper. Noodles – I can’t completely remember what was in these spaghetti like al dente noodles, but I believe they were topped with a a little sea urchin. 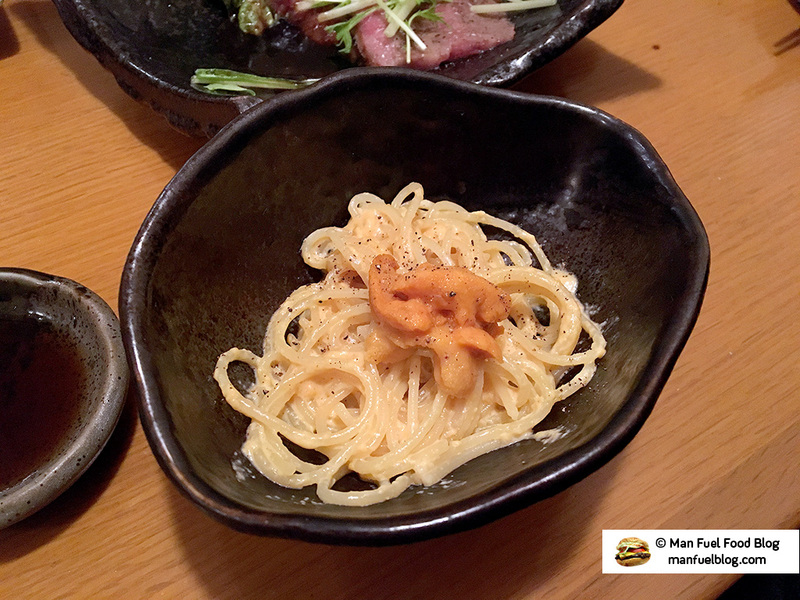 That gave the dish a refreshing ocean flavor while the creamy noodles contributed a playful base to absorb the flavors. Venison – Despite being from the U.S. where we have plenty of deer, I admittedly have limited experience eating venison. With that said, this preparation has been my favorite to date. It was a rare seared venison sliced thinly with a touch of black pepper and I enjoyed it far more than I could have imagined. I even preferred the venison to the beef actually and could have eaten piece after piece, so it was unfortunate for me that we were sharing this masterpiece of a dish. 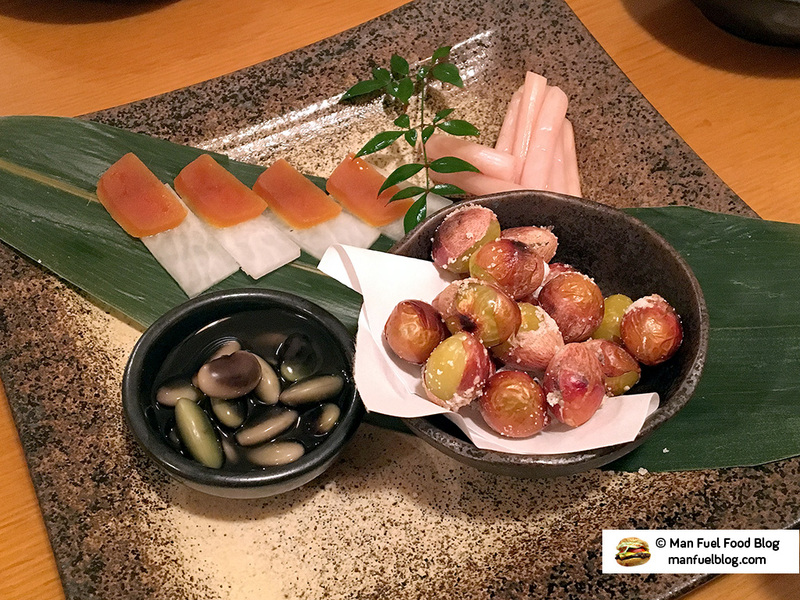 Ginkgo Nuts, Daikon, and Natto – As an end of the meal snack, we received a plate of natto (sticky fermented soy beans), daikon radish, and ginkgo nuts. I’ve eaten natto before, but never as a whole bean on its own. I very much enjoyed it despite its reputation as having a sticky texture and off-puttingly strong flavor to those that aren’t accustomed to it. Perhaps that’s due to the fact that I enjoy foods like okra and molokhia that have a vaguely similar stickiness. The daikon slices were fresh, crunchy, and crisp while the gelatinous fruit on top offered up some sweetness. The other main item on the dish that I’d never tried were the salted and roasted ginkgo nuts, which I loved. 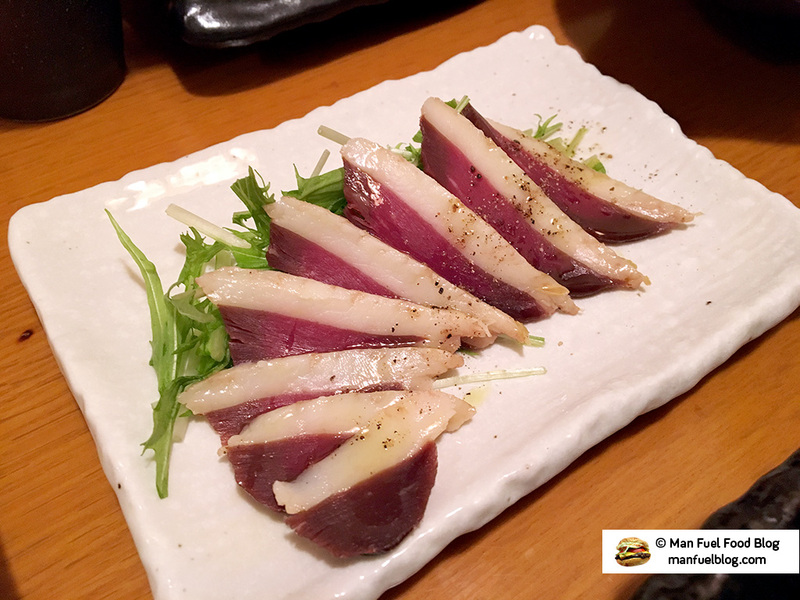 The thin roasted outer layer was crunchy and salty while the inner layer was soft and starchy vaguely reminiscent of a perfectly cooked chestnut yet with a green plant flavor. My friend told me that they were great as a snack with beer and I wholeheartedly agree. Toasted Herb Puree – I wish I could tell you what this last dish of the evening was. My best guess is that it was some kind of herb puree that was toasted with a torch. Of all of the incredible dishes we had, this last dish was my Japanese friend’s favorite. I couldn’t believe it! This last dish wasn’t bad, but compared to everything else it was just very simple and I was just shocked by his preference. The flavor is hard to explain and the best I can come up with is that it tasted very much like green vegetation with some toasted notes and a bitter aftertaste. I enjoyed these new flavors that I’d never had before (trying new things is one of my main culinary motivations!) and thought this was an interesting choice by the chef to end the meal. 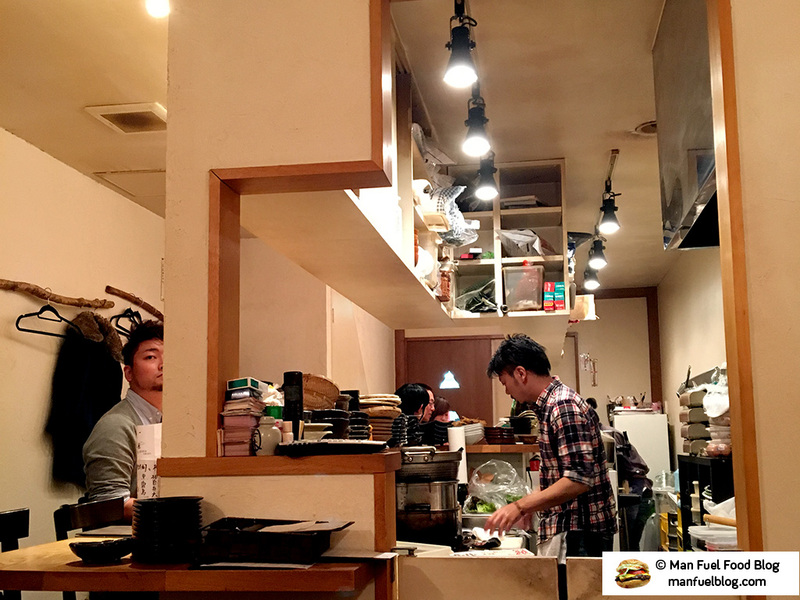 Miroku is a tiny restaurant off the beaten tourist path in Japan. Without having some local Japanese friends, I never would have known about this hidden gem tucked away in Kōenjiminami just a few short minutes walk from the train station. If you’re fortunate enough to find yourself nearby, I would easily recommend Miroku as a must try restaurant for an unforgettable experience. The food is extremely fresh and of very high quality. The dishes are beautifully presented and yet still simple in flavors allowing the main ingredients to shine. The experience is made that much better by the courteous, attentive, service and the chef-owner, Mr. Yuchiro Nakajima’s inviting personality. He welcomed us even though we did not share a common language and even made an effort to humor us with some excellently spoken English phrases! Those who are lucky enough to eat at Miroku will surely leave with a euphoric culinary contentment while simultaneously pining to return. If you enjoyed this article, please support Man Fuel Food Blog by subscribing to receive updates on the latest posts. Copyright © 2018 Man Fuel Food Blog. All Rights Reserved. The content on this page is owned and written by Man Fuel Food Blog (www.manfuelblog.com). Duplication or use of this content without permission is prohibited. The presence of this content on any site other than Man Fuel Food Blog is a violation of this Copyright. For permission requests to use some or all of this content, use the contact form in the “About” section.